Dark Souls contains a rich lore that fuels the imagination of the player and, if explored, reveals hidden mysteries and carefully crafted story-lines that enrich gameplay. This article aims to explore the correlation of Humanity and its inherent spirituality. 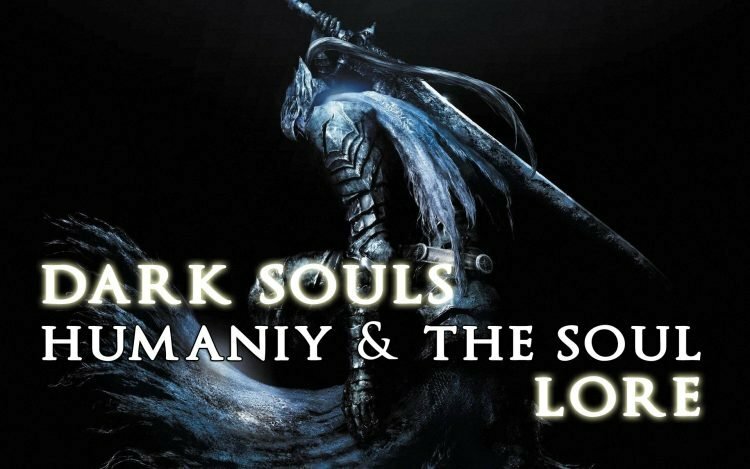 You can find more lore articles such as one on Crossbreed Priscilla, or Dark Souls 2 and Dark Souls Rune Translation. And with Fire, came Disparity… heat and cold… life and death… and of course, light and dark. This is one of the opening lines to the dark fantasy game Dark Souls, and foreshadows it’s central theme of conflicting elemental forces of the world., that of the dual-nature and clash between Fire and Dark-or, rather, the races inherently tied to each of these elements, the ‘Gods’ (Fire) and the Humans (Dark). During my first playthrough of Dark Souls, I was intrigued by the game mechanic and item named ‘humanity’, which was, by its very name, obviously linked to humans and what it means to be human. This begs the question, though, as to what exactly is humanity, what is the nature of it, and thus what is the setting saying is the essential nature of humans? And what is the difference between humanity, that which defines us as human, and the soul, that which defines us as alive? one continues to seek them. This is the in-game description of Soul items, which are literally the souls of the fallen, stored for later use. The theme of the soul largely speaks for itself, and was already developed thoroughly in the game’s predecessor, Demon’s Souls. It is the very essence of life, the will, and is what allows them to comprehend the world around them. As shown in Demon’s Souls, those without souls lose their minds and go mad-indicating that the loss of the soul can, in a sense, be survived, though not with one’s psyche intact. The person becomes will-less, merely mechanically reacting with hostility or fear to outside stimuli. This is the description of one of the most enigmatic items the game-humanity. The in-game description itself raises the question of what exactly it is, how it is different from a soul, and what it’s ‘true nature’ is. As players progress through the game, several trends in obtaining humanity become apparent. Humanity is most frequently obtained from corpses that still harbor some of this material, or by killing undead enemies in the game who, after killing enough, drop one humanity. This, if taken to have meaning beyond simply being a game mechanic, means that either few hollows have humanity, or each have so little that only after killing many does the humanity dropped amount to even one full sprite. Either way, this indicates that hollows lack ‘humanity’, and suggests that losing one’s humanity turns one into an insane monster. This echoes what some take the nature of humanity in expressions such as ‘find your humanity’, essentially finding one’s compassion, the word ‘inhuman’ meaning cruel, monstrous or evil, and so on. By this, humanity seems a precious thing that is preferable to have. As shown with the player character, losing this is, at least in short terms, does not necessarily induce permanent madness or death, unlike with losing one’s soul. Humanity is obtained as an item from corpses and certain fallen enemies, most frequently human, in the form of Humanity, Twin Humanity, and from Fire Keeper Souls. for some transgression, or by her own will? serves to disguise this ghastly form. were cradles for each tiny humanity. From these, we are given the image of humanity as a mass ob black, writhing sprites, as well as told that humanity coursed through bonfires and Fire Keepers. This image may be reminiscent of other Japanese works, such as demonic blood in Hayao Miyazaki’s Princess Mononoke, or the ‘holy blood worms’ of Hiroaki Samura’s Blade of the Immortal. These elements were connected to immortality or evil energy within their universes, and, considering humanity’s (or the lack of it) connection to Hollow, Dark Souls certainly bears a similar theme. Humanity is, lastly, obtained by interacting with other undead by crossing over into their worlds, mostly through online play. Darkwraiths and all white and/or gold phantoms each obtain one humanity upon a successful mission, either pillaging it from the owner’s corpse, or by defeating a boss alongside another human. This, if interpreted as more than a game mechanic, may be either the phantom also obtaining a sprite of humanity from the boss, or somehow receiving it from their link with another human, indicating that it grows with contact and/or sharing, or perhaps even propagates by being near other humanity. If so, perhaps there is more to the Twin Humanity item than simply being a game mechanic as well, perhaps friends or soulmates? In any case, there is a strong theme of obtaining and gathering here in multiple ways. Humans, similarly, are known for obtaining-and, just as how some view the Darkwraiths as greedy, base and ruthless, there is much discussion describing our own society, especially the West, as extremely consumer-based and far too obsessed with material possessions and goals. Such things as money, houses, food, job, social life and so on are all often described as worldly or earthy. (or keyed to the very physical earth element for beliefs that refer to elements) Many cultures and religions value such things as base or haughty, including many Eastern religions where such possessions are supposedly eschewed. Even in the West, this is echoed in how Western culture values intellectual and artistic ‘white-collar’ jobs over hands-on and physical ‘blue-collar’ jobs. Also take into account the almost-inherently social aspect of humanity that is not necessarily the same with souls, and there is also a thread of individual identity connected to the soul, while humanity is bound to group identity. Again, there is a real-world parallel found in many thoughts such as Trancendentalism, which strongly emphasizes and values the self over others and community. Howver, this social aspect also is what contains compassion, empathy, and emotion and want beyond simply greed, just as the word ‘heart’ is used in Western culture. Indeed, humanity and soul can easily be replaced by ‘heart and soul’.This, combined with the materialistic, obtaining aspect of humanity and the spiritual aspect of the soul, combines to make two different concepts and forces; humanity, or the heart, the part of a person that wants and hungers, feels emotion, that gathers and obtains and wants to have material and connects with others; and soul, the part of a person that seeks to connect with the divine, rather than with others, that creates meaning and purpose, and is the consciousness itself, the individual who must exist before there can be any group. Next, there is it’s usage. Humanity has five game effects in Dark Souls; to reverse Hollowing, to kindle bonfires, to offer as a covenant reward, to be fed or sold to Frampt for Souls and boosting the defenses of those who hold extra humanity. Likely the first use of humanity players stumble across is that it is used to reverse hollowing-returning the player to being human and allowing them to contact characters from other worlds. This, again, strongly suggests that the state of being Hollow is connected to or even caused by losing one’s humanity. Even outside of the in-game sense, that is, in a sense, true; a person who is said to have ‘lost their humanity’ or is performing ‘inhuman’ deeds can be likened to a monster, and the expression to ‘find your humanity’ means to regain one’s compassion. Then there are character in-game who hunger for and crave humanity in plenty, such as Darkwraith Kirk, Knight Lautrec of Carim, and all Darkwraith enemies and players. They, too, are portrayed as monsters, and yet bring up the question of whether a person with more humanity than another is somehow more ‘human’ than another, such as clerics and priests who hold much of it. These beings, by the very nature of being humanity-thieves, are prone to having more humanity than most, and are consumed by a hungry greed for it. Perhaps, then humanity not only grows and multiplies; it desires, and it consumes and feeds, leading to rampant greed in excess. Humanity is also used to kindle bonfires. Humanity, as do humans, seems to grow and multiply; this effect seems to pass on and infuse the fire, causing it to grow and strengthen as more humanity is poured inside it. The Darkwraith and Chaos Servant covenants both use ritually sacrificed humanity as a means of deepening the player’s covenant affiliation and rising in the hierarchy. For Darkstalker Kaathe, the Primordial Serpent creator of the Darkwraiths, beings empowered to rip the humanity out of still-living beings using the technique Lifedrain, this is an obvious choice, though what he does with it is less so. Perhaps he devours it, or perhaps he uses it to strengthen the Abyss and further the spread of the Dark. As for the Fair Lady, leader of the Chaos Servant covenant, she is swarming with humanity already, and lays eggs abound, each filled with humanity. Perhaps, as with bonfires, the ever-growing nature of humanity strengthens and infuses her, or perhaps it has come to be a necessary poison in her diseased-state, dying without enough of it to continue to lay eggs. Humanity, then, again, seems to be a physical manifestation of the growing,multiplying and spreading nature of humanity, now with the consumptive element more emphasized. In the Age of Ancients, when there was only ‘grey crags, archtrees, and everlasting dragons’ in the endless mists, deep underground, the First Flame was born. Within the Flame of Disparity were found the first souls, the Lord Souls. Gravelord Nito and the Witch of Izalith each took a soul, and Gwyn, Lord of Sunlight, took the mightiest of all. However, a small being, the Furtive Pygmy, found a ‘unique’ soul; the Dark Soul. He recognized the different nature of the soul, with its spreading, multiplying, physical and devouring aspect, and spread fragments of it among his children, each of which, as Miyazaki, the game’s creator himself confirmed, became the sprites named humanity. Humanity, thus, is by it’s very nature the essence of the Dark, a race literally made by it. As humans spread and grew, so did the humanity sprites-and thus, so, too, did the consumptive Dark, constantly encroaching on the power of Fire and its race, the Gods. When the player reaches the DLC, there is much more talk of being human or not, whereas previously the npcs were concerned with whether the player was Hollow or human, not the player’s race. Elizabeth, Gough, and Ciaran (and Artorias in his deleted boss dialogue says that ‘surely you humans are more than just Dark’) all make particular note of the player being human and express their wonder as to the true nature of humanity. As the player begins to descend into the Chasm of the Abyss, the player encounters warped Oolacilians, Dark sorcery and self-moving humanity sprites as enemies. The Dark magic spells are especially informative regarding the nature of the Dark, and thus humanity. Again, this reinforces the connection of humanity to the physical and material. Perhaps it reflects man’s cruelty against his own. This brings reinforces the potentially greedy, destructive aspect of humanity present in Darkwraiths or those who become consumed by their own desires. The black flame spell, found near the Abyss, is connected to the Dark, and, like all dark magic, partly inflicts physical damage. Again, this reinforces the physical, materialistic and wanting nature of humanity and the human heart. And then there is the matter of Manus, Father of the Abyss. Manus was one a man who later became the ‘Father of the Abyss’ and is found in the Chasm of the Abyss, holding Princess Dusk captive. Half of a broken stone pendant. The vine appears to originate from Oolacile. There is also a comment from Princess Dusk of Oolacile, who was held captive by Manus, after the event. Manus, while hostile, was not outright evil, only driven to insanity and hostility out of his urge to have his pendant. As Dusk describes Manus’s feelings, that the very nature of the Dark and humanity is to want, to have goals and desires at the risk of insanity, is again reinforced. Players can obtain either souls, a sorcery catalyst, or a sorcery spell from Manus’s soul. Again, the physical nature is reinforced. And, again, the danger of insanity, the connection to emotion and to seek out and pursue is again tied to the Dark and humanity. It is also worth noting that it specifically mentions that the humanity is granted will, meaning it has none of its own. This, again, reinforces that the will belongs to the soul, not the humanity/heart. With all of this taken into account, humanity/the heart is shown as what defines us as being human. It is desire, the aspect of a person that wants food, home, companions, and is the source of our deep emotions. It is physical, material, and becoming consumed by it runs the risk of wildly destroying and devouring everything, while to lose or eschew it altogether is to lose what makes us human, hope, compassion, sanity and fall into a neither-living-nor-dead state called undeath. The soul what defines us as living beings at all. It is the will, the voice that moves the rest of the psyche into movement, and is spiritual in nature. The soul grants life, and lets that life comprehend the world around it. To lose it is to what makes us alive lose one’s will, the true spark of life differing humans from other creatures and objects. This is a wonderful spiritual metaphor, of the Dark and Earth heart that is the heart and humanity, and the Light and Heaven that is soul, both existing within each human. These two essences are literally what make us human and what make us alive, and show the beauty and risks of having and losing each by way of an epic story. Applied to real life, this is a commentary about the beauty and atrocities, gifts and risks, presented by having, losing and taking these energies and results thereof in an utterly dark, fantastical and epic story of the human heart and soul. Really enjoyed this article. Very Good. Hi! Welcome to the site I think! Thank you for a great comment, the Dark Sign is indeed a mystery item and the reason we chose it as the Wiki’s Favicon! Hey so I got the pre-order card from Gamestop and I already put my codes for the 2 bonus items in at the /redeem web site and it said it took them, and it won’t take them again so I’d assume they’re registered. But I don’t have them in game and they’re not showing up on my downloadable content list? Am I missing something? I really appreciate the time and effort that went into this article, it shows you’ve spent time thinking about the lore and its intricacies and how gameplay meets settings. Thank you for a really interesting read and I hope there’s more of this in the future! Very interesting read and obviously hard work put into it! Heh. I developed this throughout my first playthrough of Dark Souls, which was early 2012, and I’ve only developed it since. So, yes, I’ve spent a lot of time on this. I’ve had this in the back of my mind for a while, and I finally decided to share it. It’s amazing some of the things you miss, and then someone writes an article like this and it makes you want to go back and play and pay EVEN MORE ATTENTION. Like the 3rd or 4th time this has happened to me now. Anyone else experienced this? Repeatedly, Cas. And each time, the information in this has only gotten more developed and reinforced. I wrote this long before Dark 2 was out, and I think Dark 2’s lore actually contradicts 1’s in a myriad of ways. Even then, though, 2 actually supports this as, as I said, humanity is ‘heart’, worldly emotion and desire for material/external things. Ie, the ‘curse of want’ is entirely in line with this supposition, actually. Moved this to DKSII General Discussion since people were interested and unable to find it. I’ll move it back to Archives after a while. BTW Nevris… we need a DKS2 version of this!!! excellent read and well organized.